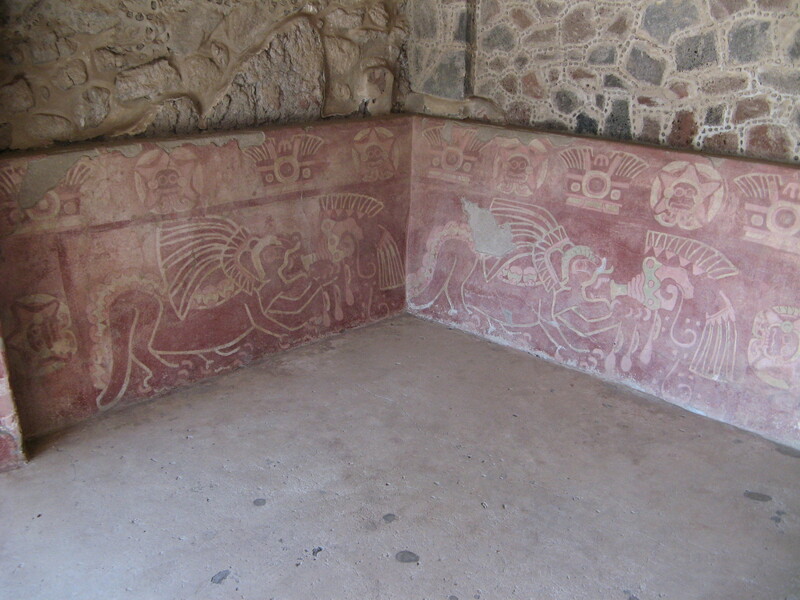 On Monday, we traveled 35 km out of the city to the ancient site of Teotihuacán. There are very few trees at Teotihuacán and precious little shade, and the thing to do is get up at 5, get there by 8 and beat the heat, but while there must be some families capable of such a thing, we’re not one of them. 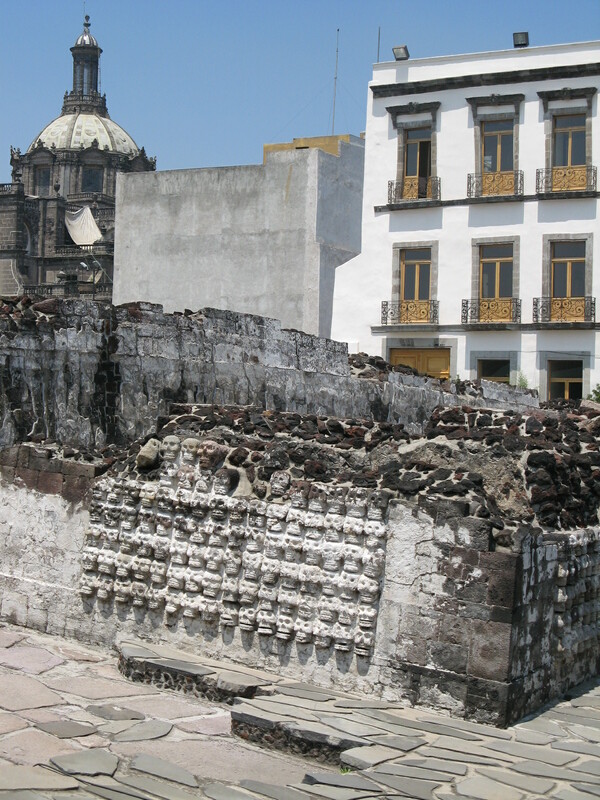 No one is quite sure who lived there–the city was already in ruins when the Aztecs came along, and their guess about who had built it was passed along for centuries until archaeologists cast doubt on it–and the purposes of the temples, assuming the pyramids were temples, are also a matter of educated guesswork. 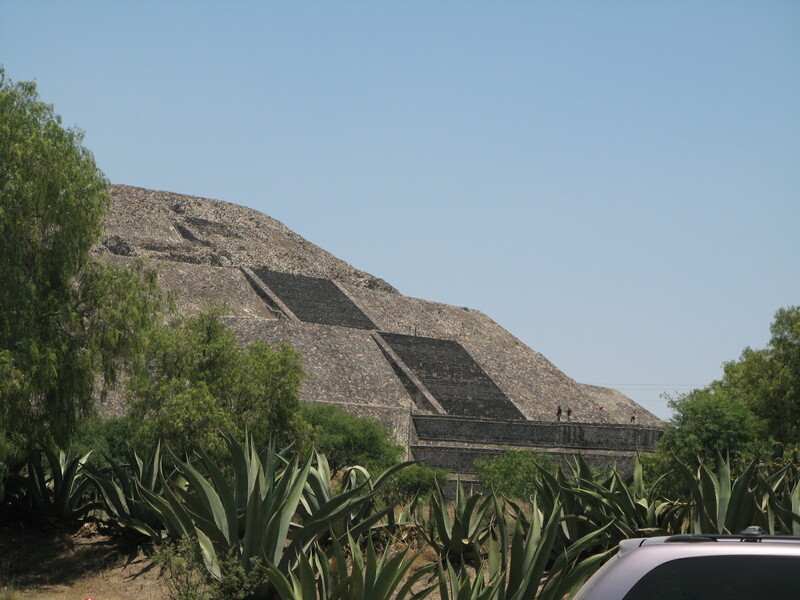 The larger of the two enormous pyramids is still called the Pyramid of the Sun, but the information plaque next to it theorized that it was actually a temple to the god of water. If the weather here in the 5th century was similar to today’s, a preoccupation with either would be understandable: the sun because you can’t get away from it, water because you wish you had some. It is strange how a city can become a ruin. Not how it got that way, I mean (though that’s a mystery too–why was the city abandoned? Invasion? An internal uprising? ), but how hard it is for us to see past the “ancient ruin” status and picture it like our own cities, filled with all the noise and activity of life. 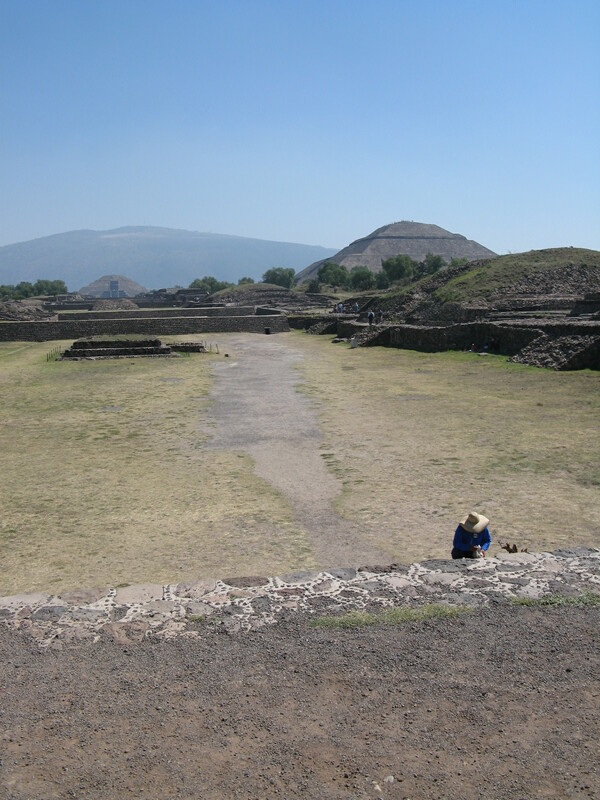 The wide-open spaces of Teotihuacan seemed like they’d always been that way. Even walking among the acres of former homes, even seeing remnants of the paintings that once covered many of the walls, it was hard for me to imagine people walking around there, cooking their dinners, leaning against a wall for a chat with a neighbor, trotting up the steps. It wasn’t until I got to Templo Mayor, a few days later, that I could really stand within a long-ruined building and imagine it busy with people. For one illuminated moment, I really understood that they were there, in that place, just five hundred years ago, and that they weren’t thinking, “What a fabulous temple–it’ll make an impressive ruin one day.” They weren’t picturing their brilliantly-colored murals faded to fragments. They just swept the floors, got the ritual objects out of the closet, put their worship clothes on, and started the service. I could almost see the crowd strolling along the wall of sculpted skulls. Maybe it was easier to picture Templo Mayor as a living place than Teotihuacán because it is smack dab in the middle of a huge city; or because it has a roof overhead and so it feels like rooms instead of ruins; or even because it was used so much more recently, not by ancients whose name for themselves we don’t even know, but by the practically-modern Aztecs. Maybe people in Mexico are better than I am at recognizing their continuity with the past. They certainly honor it more, despite being a thoroughly modern nation. For example, they’re less likely than we are to knock down old stuff to bring in the new, instead incorporating the old into the new. 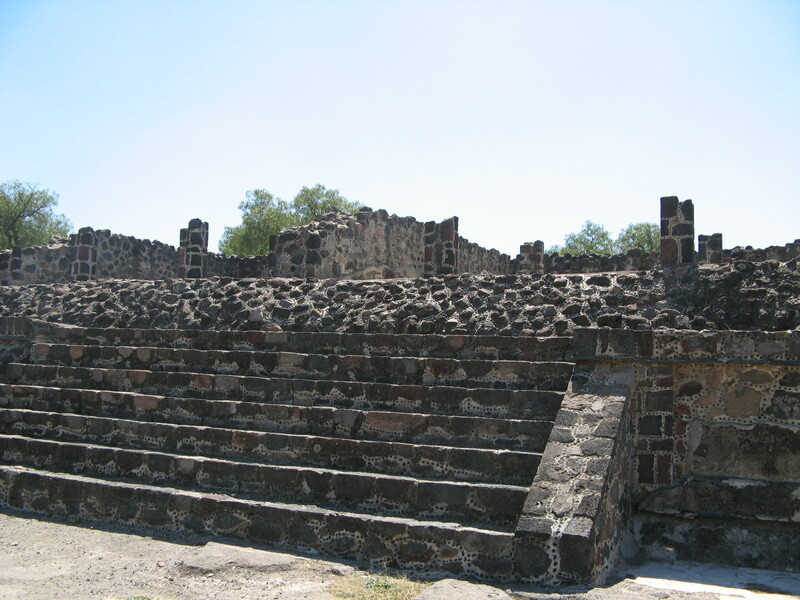 (I just learned that when Wal-mart built a store near Teotihuacán, workers were ordered to hide the artifacts they dug up–those who blew the whistle got fired. I’m feeling worse and worse about that stroller.) In San Miguel they are forever pulling up cobblestones to do work on the streets, and when the new pipe is laid, they put the cobblestones back. Modern Mexico also has a very different relationship with its indigenous roots than we have with ours, not surprisingly for a country where almost everyone is mestizo (mixed, i.e., partly native), but those are musings for another post.